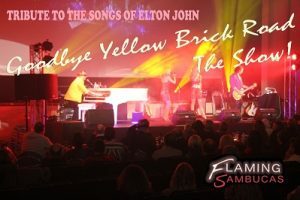 Flaming Sambucas bring to life the timeless songs of Elton John and Bernie Taupin with Goodbye Yellow Brick Road – A Tribute To The Life And Songs Of Elton John. 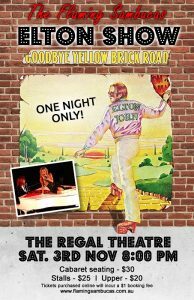 This One Night Only event will perform all your favourites including Candle In The Wind, Goodbye Yellow Brick Road, Can You Feel The Love Tonight, Philadelphia Freedom and so many more at the Regal Theatre on Saturday 3rd November from 8pm. You will be captivated as the Flaming Sambucas take you on a musical and visual journey from Elton’s beginnings – performing a wonderful soundtrack to our lives whilst also telling his incredible and emotionally charged story along the way. Click HERE to watch Flaming Sambucas Live. Since forming in 1991, Flaming Sambucas have entertained audiences locally, nationally and internationally and remain one of Australia’s most sought after bands for corporate events. Featuring Terry Nicholas at the majestic Grand Piano and brilliant vocals by Natalie Ermer Jensen, Jodie Dry and Shelley Pantic-Lund together with dynamic Matthew McNamee on drums and the masterful Rob Pippan on guitar, this will be a night to remember! Cabaret seating has completely sold out, but fabulous seating is still available in the stalls and upper sections of this grand venue. 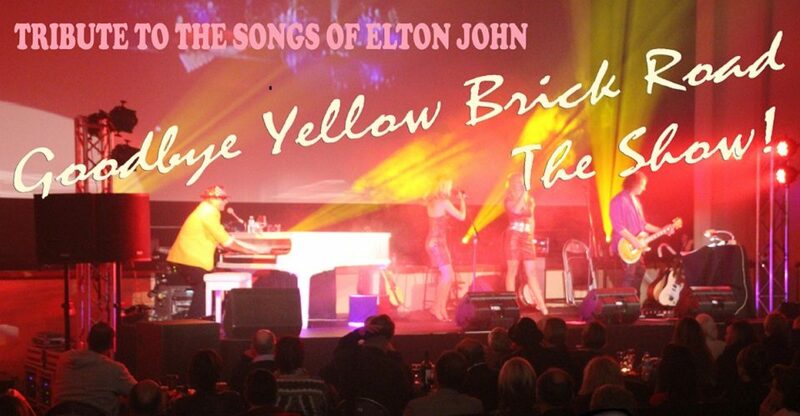 Flaming Sambucas perform Elton John: Goodbye Yellow Brick Road at The Regal Theatre, 275 Kensington Road, Kensington Park, from 8pm on Sat 3 Nov (Doors open 6:30pm). Book at The Regal Theatre on <theregaltheatre.com.au>. Click HERE to purchase your tickets. Please note: This is a licensed event. Click HERE for your chance to win one of two double passes to see Flaming Sambucas – Goodbye Yellow Brick Road.